Over 5,000 decision-makers and professionals in the restaurant build, design, furnishing, and equipment technology sectors will be attending the Restaurant Show, the region›s only dedicated event for restaurants and food and beverage outlets. World´s leading trade fair for industrial coating technology. The Gulf Property Show 2018 is a boutique showcase for the real estate and property development sectors, that aims to highlight present and future developments in the Kingdom of Bahrain and the Northern Gulf, and provide the opportunity to promote Bahrain’s property assets as well as regional and international opportunities for investors in commercial and residential real estate. Interiors 2018 is the dedicated event for luxury, creative and designer products for the home or commercial spaces providing exhibitors with a unique opportunity for their products. The 2018 summit will delve further into the opportunities that are present in Lebanon’s energy sector as well as address the challenges and the road ahead for companies and investors in the field. Argus has rebranded its annual Asian petroleum coke conference to the Argus Asian Solid Fuels conference to better address market changes. The largest international business-to business event for the sports, fitness and health industries in the Middle East. In line with the Dubai Blockchain Strategy, announced by HH Sheikh Hamdan bin Mohammed bin Rashid Al Maktoum, Crown Prince of Dubai and chairman of The Executive Council, which mandates that Dubai becomes the world’s first-ever government to execute all applicable transactions using blockchain technology by 2020. Providing the West African mining and power industries with introductions to new suppliers, new technologies and new techniques in respect of mining machinery, earth moving equipment, crushers, materials handling and all primary requirements including site management. Polymer Foam 2018 will offer a lively interaction between an international panel of speakers and delegates, which stimulated debate in all sectors. 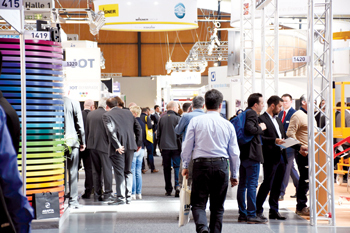 Compounding World Expo 2018 will feature an international array of suppliers of polymer additives and compounding machinery and equipment, as well as providers of related services. The Plastics Recycling World Exhibition 2018 will feature an international array of manufacturers of plastics recycling machinery and equipment, as well as suppliers of materials, additives and related services for plastics recyclers.